and Domestic Wastewater Treatment Systems in mobile container. Small sewage treatment plants, non electric purification plants by ClearFox® EN 12566-3, Septic Tank upgrades produced by PPU Umwelttechnik GmbH Service through partners worldwide. If you are looking for a tough sewage treatment plant which is built using latest technologcal advancements. Which has the lowest energy consumption of any model available on the market. Which is plug & play and made in Germany! Which can be shipped (15 plants in one Container) to any destination worldwide. These purification plants are completely pre-assembled systems which can be extended as required with the necessary modules. The effluent of our sewage treatment systems can be discharged into field lines as well as directly into rivers. container sewage treatment plants are durable and can be installed in restricted space conditions. All of our packaged systems work aerobic, which gives a very fast degreement of all organic pollutions. Improved process technologies and higher cleaning performances by small sewage treatment plants lead to higher acceptance rates with authorities and in private households. ClearFox® nature is a small sewage treatment plant without power requirement. 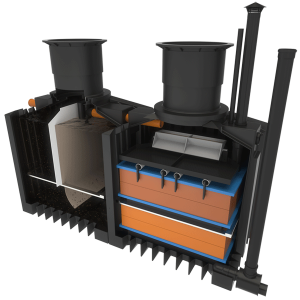 Small sewage treatment plants by ClearFox®: clean, easy and efficient! The water from the outlet can seep away, be directed into an outlet channel or be returned for raw water treatment. In case of sufficient incline, the plant can be operated without power, i.e. without power connection. ClearFox® nature is a new generation of small sewage purification plants. Based on our long-time experience with cascaded bio filter plants, the technology was adapted specifically to the quality tank system aquaplast®. We developed a high quality, durable sewage treatment system for small sewage purification plants, without using technical wear parts prone to malfunction. If the incline is sufficient, the small sewage purification plant can be operated without any power connection. With an integrated mini-pump, the clear outlet can also be lifted. Due to its simple structure and the biofilm technology used, the small sewage treatment plant is well suited for decentral operation. 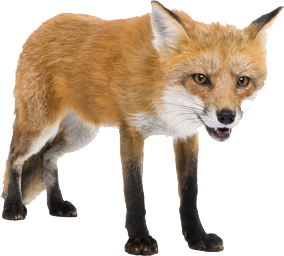 Unique and attractive – arguments in favour of the ClearFox® nature! We offer individual solutions for any area of use. Small sewage treatment plants in modular construction. Highest individual weight 115 kg. No crane on building site required. The plants convince due to their simple and quick assembly. Operation is fully automatic. Due to an integrated energy saving mode, the sewage treatment plant adapts to the actual sewage volume, which saves energy.